On many furniture items there is often a circular plate attached thereto with the company name and address inscribed on it. The plate was made from celluloid, a cellular and camphor thermoplastic process, dating back to the 1860s. It was often known as ‘French Ivory ‘. In view of its importance in recognising genuine Castles furniture products we show here a picture of a plate taken from an item in our archives. Its presence will also add to the value of the particular item concerned. 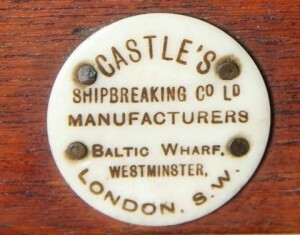 Sometimes the plate will have the name of a particular Ship included on the plate indicating that the wood used to make the product came from that particular ship. The names ‘Arethusa’ and ‘Ganges’ are the most common that we know about at the present time. All information on this site is protected by copyright. (C) 2006 - 2018 Castles Shipbreaking.